This FREE professional development session incorporates elements of both arts-integrated and hands-on learning experiences with Digital Literacy, English Language Arts, and Science. You will see how to use art, starting with exhibits in the galleries as springboards, to dive into the connections between the Arts, Digital Literacy, and English. This day-long workshop is especially for educators and parents in Bladen, Brunswick, Columbus, Duplin, New Hanover, Onslow, Pender, and Sampson counties. We will provide time and support for arts-integrated lesson planning. This program is funded by the Joseph and Elsa Flowers Davies Fund. This professional development session is offered free for all educators and parents in Bladen, Brunswick, Columbus, Duplin, New Hanover, Onslow, Pender, and Sampson counties. Designed collaboratively by the Cameron Art Museum and the Southeast Center for Arts Integration, it incorporates elements of both arts-integrated and hands-on learning experiences with Literacy. We will use the art exhibits in the galleries as springboards to dive into the connections between visual literacy and reading and writing, and between visual art, literary art, and theatre arts. We thank the Joseph and Elsa Flowers Davies Fund for funding. CEU’s: We plan for the workshop to result in CEU’s for teachers. We provide participants with workshop descriptions and vitae of facilitators. Participants will receive a Certificate of Completion. First of all I just want to say Thank You!!!!! I really enjoyed every session of the workshops. I loved the rhythm games that were introduced to us and plan on using them to help my pre-k students with rhyming words. I will also be using the movement piece to help them understand personal space. There was nothing that did not have value in it. I can and will use every part as often as I can. This year is almost over but watch out next year I am ready!!!! … I look forward to the next part of the series. This professional development session was offered FREE for all educators and parents in Bladen, Brunswick, Columbus, Duplin, New Hanover, Onslow, Pender, and Sampson counties. Designed collaboratively by the Cameron Art Museum and the Southeast Center for Arts Integration, it incorporates elements of both arts-integrated and hands-on learning experiences with Mathematics, Science, and Literacy. We thank Duke Energy Foundation and the Joseph and Elsa Flowers Davies Fund for their generous support of this on-going initiative. Traditional textbooks and verbal instruction in Mathematics, Science, and Literacy can fail to engage the portions of the brain that can truly comprehend and apply the concepts essential to deep understanding. These workshops build on strategies that foster deep understanding by engaging the whole brain and offering opportunities for both concrete and abstract experiences. They address multiple strands of the Common Core and NC Standards for Science, Literacy and Mathematics for grades Pre-K-8. Teaching artists who are masters at providing experiential, collaborative learning experiences to both teachers and students led the workshops. 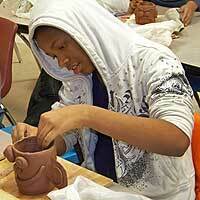 Activities that engage our students and provide for hands-on activities always keep our students learning. Thank you for all your ideas. I am now looking at ways to try them in my room. I have attended many teacher workshops as I have 12 years high school teaching experience and yours made me excited to get back into the classroom and try many of your ideas. Please keep in contact and let me know when you have your next workshop. I will be there. CEU credit was approved by the 8 counties and the NC Division of Child Development and Early Education. We provided workshop descriptions and vitae of workshop facilitators. Participants received a Certificate of Completion. Duplin County Schools Full STEAM Ahead! Thanks to Kevin Smith at Duplin County Schools for arranging a professional development session with K-5 teachers. The workshop was called, “Full STEAM Ahead! Closing the Gap in STEM Subjects Through the Arts.” We explored how Dance and Theatre Arts can be integrated with Mathematics and Science. We made human graphs, used our bodies to compose and decompose. We collaborated to express mathematical and scientific principles through theatrical and dance performances. 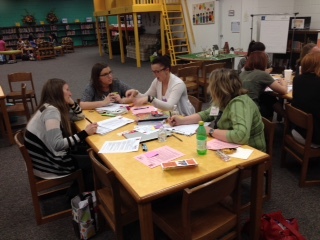 In the pictures, the teachers are working on lesson plans based on the workshop. The workshop was sponsored by the Cameron Art Museum, facilitated by Sheila Kerrigan, of the SE Center for Arts Integration, and funded by Duke Energy and the Corning Foundation. Many thanks to all involved! We are excited to be presenting at the A+ Schools 20th Anniversary Conference in Durham, NC, at the Carolina Theater, on August 3-5th.